Caption: RNLI to the rescue after boat goes aground. When the Poole Lifeboat launched just before 4.30pm on 9 July to assist a 28 foot boat that had gearbox failure, the crew recognised the vessel because its owner is the station’s volunteer lifeboat operations manager. 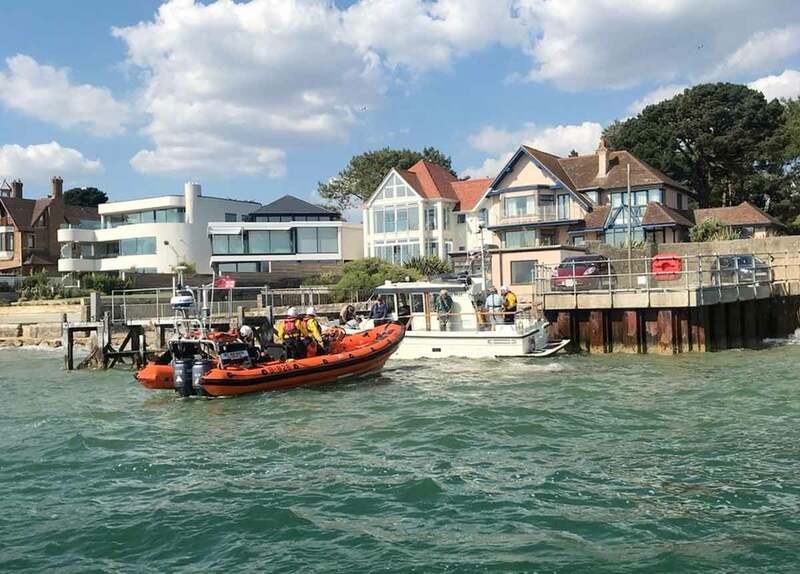 The boat had encountered a problem with its gearbox at the entrance of Poole Harbour and the slight south-westerly breeze had nudged the boat with its five crew members on to sand on the east side, north of the chain ferry. When the lifeboat volunteers arrived they found the boat firmly aground. A crewman was transferred across to check all was okay and a towline was attached. An attempt was made to pull the vessel free but it wouldn’t move. A decision was made to transfer the crew ashore at nearby North Haven steps to lighten the load then the lifeboat tried again to re-float the vessel. It was successfully released and once afloat, the lifeboat towed it to its berth at Cobbs Quay. In the meantime the owner, Paul Glatzel, had dispatched another vessel to pick up the stranded group of five from the North Haven steps. He said, “As volunteer lifeboat operations manager at Poole Lifeboat Station and as someone who runs an RYA Training Centre, whilst I’d certainly prefer that one of my boats doesn’t need assistance from a lifeboat, the reality is that if you spend many hours afloat sometimes things don’t go quite as planned. “On one of our boats it seems that the engine stuck firmly in forward gear and going into reverse increased forward revs leading to the vessel grounding alongside a jetty. The highly experienced instructor on board dealt with the issue really well and after ensuring everyone was okay sought assistance from Solent Coastguard immediately advising them that he would need the assistance of Poole’s Atlantic class lifeboat to get off the sandbank. “To experience both the highly professional crew on the Atlantic and at the station assisting one of my boats was great to see even if it’s something I’d prefer doesn’t happen again!